Dubai, UAE, April 15, 2018: Malabar Gold & Diamonds, one among the BIG 5 jewellery retailers globally with a strong retail network of 215 retail outlets spread across nine countries running its much awaited promotion, ‘The Great Gold Rush' to celebrate this festive season. This promotion will run at all Malabar Gold & Diamonds outlets in the Middle East & Far East. In UAE the offer will run until 21st April, 2018. 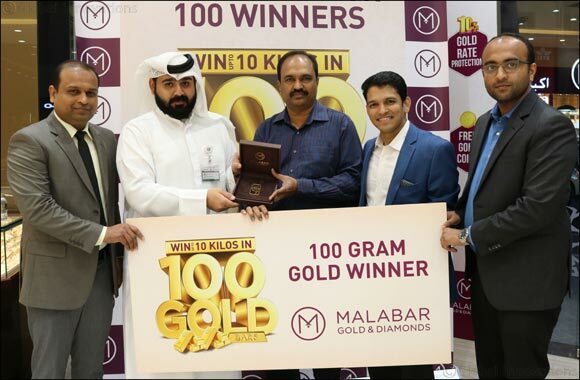 The customers get unparalleled opportunities to win a total of 100 gold bars which weighs 10 kg gold totally across their showrooms in GCC & Far East. A true shopper's delight, Malabar Gold & Diamonds will captivate the customers by exhibiting eye catching designs in gold, diamonds, platinum and precious gems from different parts of the world to flaunt any occasion or event and are well priced too. Fifty four lucky winners so far has walked away with 100 grams of gold. Customers can take part in this promotion until 21st April. To add more sparkle to this season, they have also revealed their latest collection of jewellery in gold, diamonds and precious gems to suit the tastes of their multicultural and multinational customers. Malabar Gold & Diamonds has incorporated these designs as a part of various brands presented at Malabar Gold & Diamonds' namely Ethnix - Handcrafted Designer Jewellery, Era - Uncut Diamond Jewellery, Mine - Diamonds Unlimited, Divine- Indian Heritage Jewellery, Precia - Gem Jewellery and Starlet – Kids jewellery.